Distance: Either 6 miles each way and return by boat! The Season has definitely started now, with Ascot Races last week and Henley Regatta from 4th to 8th July this year. Even if you aren’t interested in seeing the rowing, a walk along the stretch of the Thames into Henley is really rewarding. We start where one of our previous walks in May 2005 ended, in Sonning village. There’s some parking on the road in the village, or you could try for a space in the small car park opposite the French Horn Hotel on Playhatch Road. From there, cross the Backwater Bridges by road and turn left over the footbridge opposite Sonning Mill Dinner Theatre to pick up the Thames Path along the north bank of the river. The whole walk then remains on this side as the next bridge along is in Henley. The path initially hugs the river bank very closely, so be careful not to fall in! As it moves away slightly you’ll be surrounded by cow parsley and thistles bursting into life, swarming with butterflies and damselflies and being dive-bombed by swifts. After about a mile, enter the woods through the gate opposite Hallsmead Ait island, then pass into a field on the other side through another gate opposite Lynch Island. Here the footpath runs diagonally across the field. If you look up, you can see the village of Shiplake high on the hill. Be careful as it gets really boggy here after all the rain we’ve had recently. Cross the small footbridge at the end of the field next to the Shiplake College boathouse. The green area here would make a lovely place to stop for a picnic if the weather’s good, as it’s right on the river’s edge. There’s a path that runs uphill to the village, but to stay on the Thames Path, cross the green to the edge of the woods and continue following the river. Pass through a metal kissing gate and carry on along the edge of the field, admiring how the other half live in the houses on the opposite bank and Phillimore Island. There’s a wooden kissing gate next, by Shiplake Lock, which is the halfway point. Turn left here and follow the small path signed left away from the river. This crosses a track and carries on across a field, passing through two more metal kissing gates. At the top of the steps after the second gate, turn left along the road to the fork with the Lashbrook House sign and the postbox and turn right along Mill Road. Turn right again opposite the small shop past the Baskerville Arms, which is County Dining pub of the year for 2007 and serves lunches until 2pm (4pm on Sundays). Hourly trains run from Shiplake Station to Henley or Twyford, but to continue on the walk, pass over the level crossing and turn left along the signed path and right at the tiny kissing gate at the end. Continue along this path, through the hole in the hedge and out onto a tree-lined avenue before taking the right-hand fork. Follow this road until a path peels off to the left at the gate and runs alongside a garden to the private house which houses a narrow-gauge railway. Cross a small wooden footbridge (beware this is slippery) in some small woods and into a field. At the other side of the field, there are several trees down on the path as it goes through a gate into more small woods, then out again onto the long wooden walkways that take you over the river to pass Marsh Lock and the weir. As you enter Henley on Thames you’ll pass the River and Rowing Museum www.rrm.co.uk which currently houses The Wind in the Willows exhibition. Entry is £3.50 for adults to the Museum, £7 with the exhibition (children £2.50/£5, concessions £3/£6) and it is open daily from 10am to 5.30pm. There is also a Terrace Café which sells yummy homemade chocolate and banana mousse. 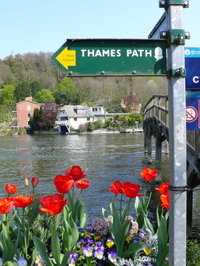 Carry on along the towpath past Mill Meadows to explore Henley where you’ll feel the excitement building for the races. The Regatta has run annually since 1839 and actually starts a mile and a half further down river at Temple Island. The Straight Course, used since 1924 is one mile 550 yards long and ends at Poplar Point on the other side of Henley Bridge. The train station is on the left just before the bridge. You could catch the train or the hourly 328 and 128 buses back (no service on Sundays), but one of the nicest ways to get back if you don’t fancy walking back is by boat. Thames Cruises www.saltersteamers.co.uk run a shuttle at 4.15pm every day in Summer, arriving in Sonning at 5.45pm and Caversham Bridge in Reading at 6.30pm. Fares to Sonning are £8.30 for adults, £7.90 senior and £4.50 for children.